Woolover covers come in three sizes. Suitable for a Friesian/Holstein calf. Suitable for larger calves 4 to 6 weeks old. All covers come in courier packs of 10 covers. Cost effective returns for farmers. At NZ$1.00 per week you can ensure all of the above. Retains calf's natural body heat. Effective in wet, windy and cold conditions. Cover breathes and avoids condensation. Helps sick calves recover faster. Covers can be reused on up to 8 calves for a period of 3 to 4 weeks each (indicative cover life period). Woolover animal covers are the natural thermal protector to promote animal growth and lower hypothermic losses. "Our maternity pens are in our open free stall barn and we get a lot of wind. So after the mother is done cleaning the newborn calf off we put a Woolover calf cover on. The Woolover soaks up the rest of the moisture and keeps the calf warm and dry. I know we saved 2 calves from freezing to death in a January cold spell. The Woolover is also easy to clean up. I just washed it down with a hot water hose and hung it up to dry. I t was dry the next day - that just makes the Woolover even more convenient to use." 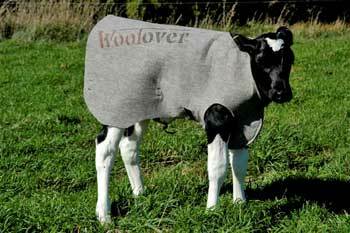 "I think Woolover calf covers are a great idea for every calf. Woolovers wear well and I like the idea of keeping the calf warm. They are great for calves in hutches or outside. Slip one on when a calf is under stress and they will perk up within 12 hours." Kim Berwald, Toronto, SD, USA. "When Duane Broek presented the Woolover product to us we purchased 10. We put them on the calves after the dam had licked them off and the Woolovers worked wonderfully. We have since purchased 29 more. We leave them on for 2 weeks on average but have left some on as long as 6 weeks. I am a firm believer in the Woolover. It makes me feel better knowing my calves are comfortable and well taken care of in winter. I have recommended them to several other people."